This is a great recipe as it is so versatile. It is delicious as it is, or you can transform it with just a couple of extra ingredients. This recipe is for a large baking tray (mine is about 30 x 25 cm), but if you want a smaller batch just halve the recipe. Gently melt butter and then add sugar and syrup. Don’t let the butter bubble, it should all just be warm and gooey. Add flour/oatmeal. (To make the oatmeal I just put a large handful of oats into my pestle and mortar and grind them for a minute.) This stops the finished flapjack being too greasy. Add the oats and mix thoroughly. 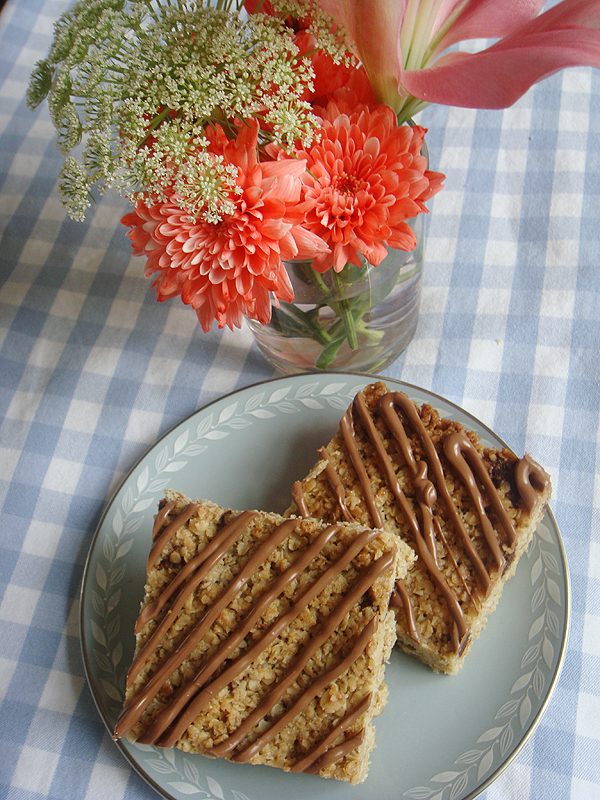 I use a non-stick baking parchment on the bottom of my tray and then just add the flapjack mixture into it. Smooth and press slightly on the top with a spoon. Bake 15 mins at 180c or gas 4 or til golden. Leave in the tray to cool, then cut. 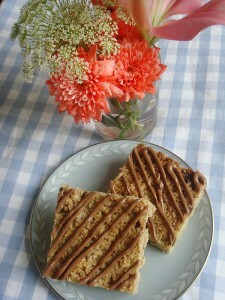 This recipe can also be used to make an amazing bakewell flapjack. Just add 1tsp of almond extract to the mix. Put half of the flapjack mixture into the bottom of the baking tray. Spread on a layer of jam. Top with the rest of the flapjack mixture. Bake as usual. This is lovely with a drizzle of icing made with icing sugar and water. Coconut – add one cup of dessicated coconut along with the oats. Choc chip – add 100g bag of choc chips when the mixture has cooled slightly so they don’t melt. Drizzle with melted chocolate when cool. Orange – add the zest of 1 orange and some mixed raisins for a fruity option.